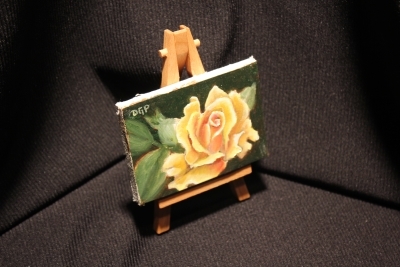 Oil Painting Demos of the miniature kind! 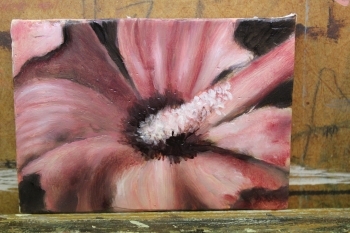 Here are my ACEO's oil painting demos that show you like the rest of those done in the flemish technique, it can be done on a smaller scale too! 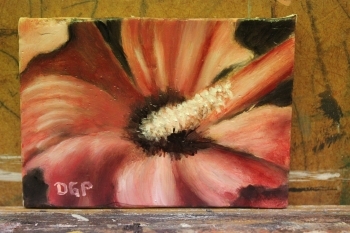 Not sure what an ACEO is? Click here to read the article, then come back here to how they're done. 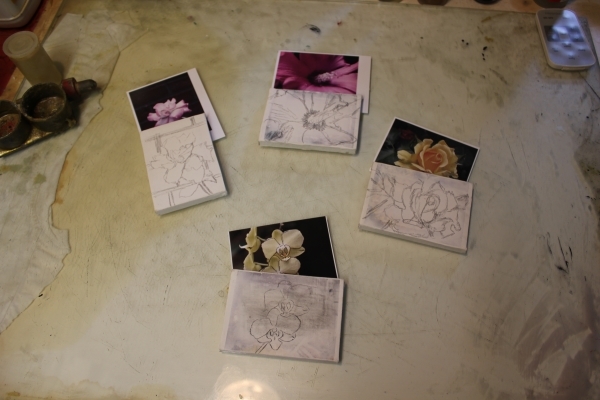 Below, you'll see I've started off with 4 miniature pictures. We'll start with the Rose of Sharon. 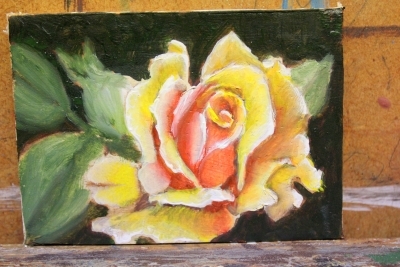 This is a painting that may become one of my larger examples, but for now, a miniature will suffice for my needs. A quick sketch, nothing fancy, just establishing edges. 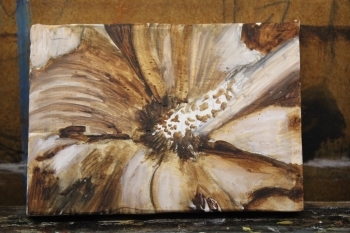 The umber or brown under painting went in quickly as well. Here however, I developed the darks and lights and established the overall tone of the painting. Here my first color layer went in with shadows defined even more. Darker areas were made darker, lighter areas were made lighter. My main color is Alizarin Crimson. A bit too pink to my liking. Here, I simply glazed in a cadmium red medium tone, added just a few more highlights, and DONE! 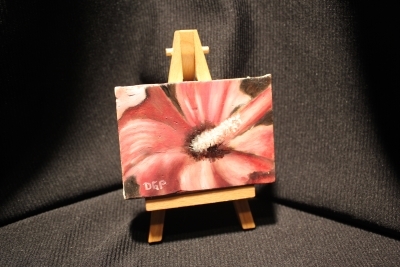 I found these cute little easels at a local art supply store to show off my little painting. I've seen these painting framed in a large 3" molding that makes a big impact on it's overall presence. Below, you can see the process again. 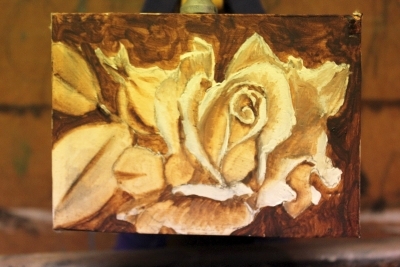 Drawing, Umber or brown under painting, color layer, then finishing layer. 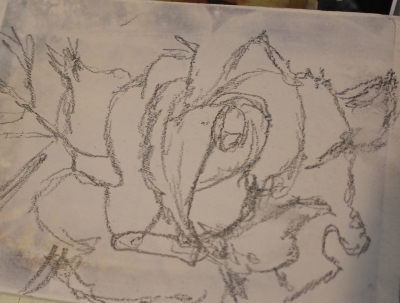 I did skip the canvas toning for speed reasons, and this made my initial brown under more difficult in that the canvas was not sealed and the paint did not glide over the surface the way I prefer. This made blending more difficult. So, lessons learned, don't forget the toning or imprimatura layer. Below: color layers and easel picture. 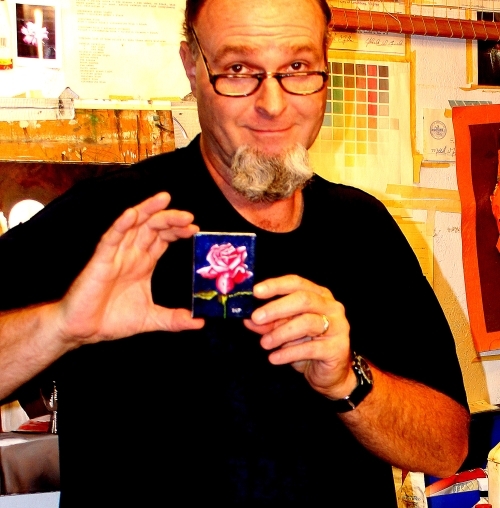 And then a picture of yours truly hamming it up with another small ACEO painting. This really gives you an idea of how small these works are. Interested in trying the flemish technique? Click here to learn more on a very special offer. 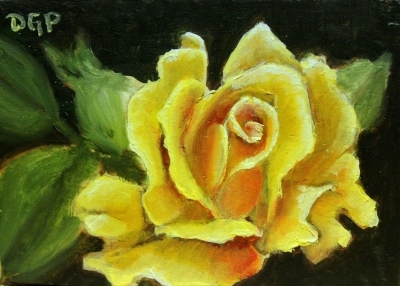 Click here to head back to the top of our miniature oil painting demos page.